Mitjorn Beach runs all along the South coast of Formentera, for more than 6 miles. 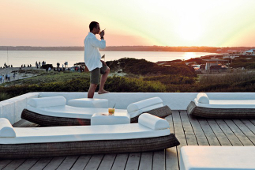 Thanks to its extension, therefore to the low concentration of tourists per square metre, Mitjorn remains one of the quietest Island beaches and maintains all its wild aspect intact, although there is no shortage of apartments, hotels and houses, and Formentera Libre offers you a wide choice. Especially the southest part of Mitjorn, towards the lighthouse of Mola, remains a paradise chosen by naturists and diving or snorkeling lovers. The quality of Mitjorn Beach and its waters indeed fully respects the standards of Formentera. If you love the beauty and the colors of the sea, we recommend a small deviation (only 2 km) from Mitjorn towards Es Calo, a tiny village on the opposite coast where the remains of a Roman Fortress are still visible, with a small rocky Cove and the beautiful beach of Es Calo, famous for its shades of blue and light reflections given by a special type of minerals in the rocks. Also in this area of Formentera obviously there is no shortage of restaurants, bars and beach chiringuitos that will give you the chance to enjoy the sunset and magical Formentera evenings by the sea, in an ideal situation of peace.